Coffee carts located in Park Hall, the Park Center for Business and Sustainable Enterprise, and the Center for Health Sciences are quick and convenient ways to grab a bite to eat or an extra coffee. You’ll find breakfast foods -- bagels, muffins, OJ, croissants, cereal -- as well as salads and sushi for lunch. The newly opened Park Center cart also offers gourmet espresso and cappuccino drinks. Here you’ll find the Campus Center food court and the La Vincita café, which serves up gourmet coffee drinks and savory flatbread sandwiches and pizzas. At the food court, you can pick à la carte items from the grill, Mexican food stand, sandwich bar, vegetarian section, and refrigerated shelves of fresh packaged salads and sushi. A popular location for upperclassmen, campus events, and studying, IC Square is one of the largest and busiest dining spots on campus. Located in the concourse between the two Towers residence halls, this is a convenience store and a late-night sandwich shop. Amid walls lined with snacks, students can get a sub, a coffee, or a small bite to eat until two o'clock in the morning. 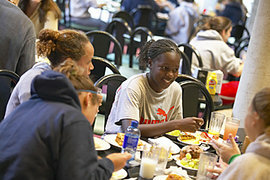 Find out more about dining and your meal plan options at Ithaca. Food is a major part of undergraduate life. As a new student at Ithaca College, you’ll find that many friendships are forged in the dining halls out of habit and hunger. 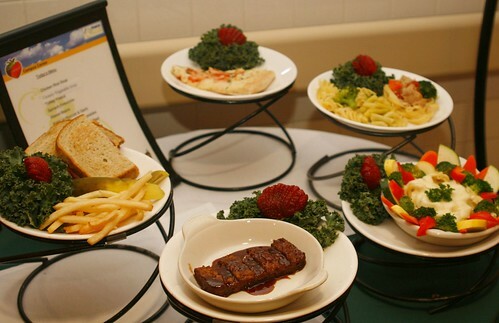 Get a better taste of IC’s dining options with our on-campus cuisine rundown. There's something on the menu for everyone at Ithaca. Located high atop campus near the Terraces residence halls, the Terrace Dining Hall immediately grabs attention with its spiral staircase and fountain surrounded by iconic columns and hanging plants. The largest of all the dining halls, it also features an upper dining level and a section known as the island, where a few tables are situated on a platform above a shallow pool of water. The sound of trickling water, if still audible amid the busy clutter of trays and chatter of students, is a tranquil complement to any meal. Fare ranges from home-style dinners at the Charleston Market to the salad, pizza, and pasta bars to the sandwich and wrap stand. These choices are pretty dependable, but many students are drawn to the exhibition cooking, where you can watch the chef prepare customizable dishes with as many fresh ingredients as you want. The Kosher Kitchen is by far one of the most endearing and savory aspects of campus dining. Featuring delicious kosher dishes, this spot attracts a diverse range of eaters following Jewish dietary law or not. Getting here is a hike for students who live lower on campus. Food-wise, be mindful of the carved meats in the Charleston Market that may have sat too long under the heat lamps. It’s best to arrive early or late for lunch to avoid the noon rush. Our dining halls do more than serve up meals. They also play host to dozens of events every year. 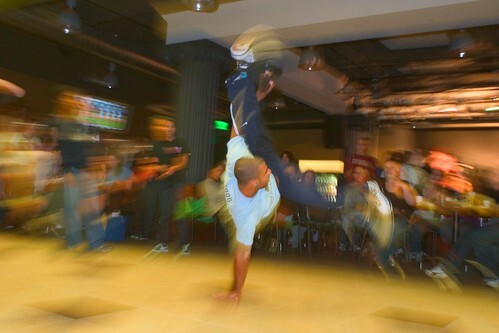 Here Roniel Bencosme '10 busts an L-kick at the annual Career City Coffee Cafe at IC Square. Scenic views of Lake Cayuga and the surrounding Ithaca community are afforded from some tables in the Towers Dining Hall, located between the West Tower and East Tower residence halls. Though smaller than the other dining halls, Towers never seems too crowded, which creates a laid-back atmosphere. Equipped with cozy booths, it has more of a restaurant vibe than the other dining halls. One of the largest draws is the Fresh Food Market, which serves organic, natural, and locally grown food. Aside from the typical noon fare, in-the-bag lunches are available for those on the run. Expect to get your just desserts at Towers; it’s the only dining hall on campus offering a variety of milkshakes throughout the day. They also add a personalized touch to sweets, sizzling and stirring up customizable crepes and chocolate fondue. Late Night is the headquarters of many students’ after-hours dining on campus. Catering to collegiate night owls, Late Night serves up themed menus. Its appeal is more than just food though; Late Night also provides an opportunity to slow down and socialize. Towers isn’t open on the weekends. One would also be wise to watch out for burgers that look like they’ve been on the grill for too long. 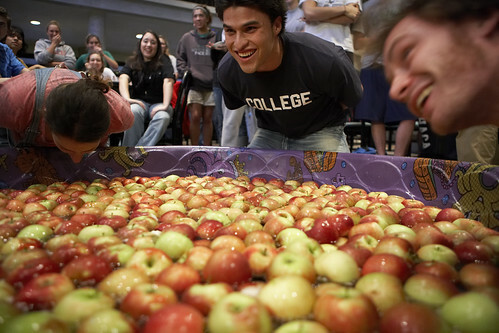 Students line up to bob for apples in the dining halls during AppleFest. 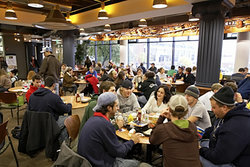 As the name suggests, Campus Center Dining Hall is located in the middle of campus, making it the most crowded for mealtimes. It resembles a traditional cafeteria with its small, packed-in tables. The windows that line the exterior wall provide views of the Fitness Center, which may or may not be a bad thing for students finding it hard to cope with the all-you-can-eat service. This is another place to try exhibition cooking. Students can also find a wide array at the grill and the sandwich bar, where a selection of breads, meats, veggies, and cheeses are available to stack the perfect combination. Customizable egg orders and a Belgian waffle bar make weekend brunches here popular. Those on the run can grab and go with customizable bag lunches. And for dessert, make sure to hit the ice cream stand or the baked goods on the way out. The vegan station entices all types of students, particularly when it comes to the crisp, warm sweet potato fries. Dining here proves that dietary ideology doesn’t have to be restricted by plain, humdrum food when innovative dishes like roasted vegetable and hummus pitas and zucchini tapenade baguettes are on the menu. Students eating at peak hours can have a hard time finding a table. Campus Center also features the entrée, starch, and vegetable section, which, day after day, can feel somewhat like a continuously recycled Thanksgiving dinner.